As we finish the year and move towards the start of 2019, it seems like an appropriate time to reflect on the year’s accomplishments and, sometimes, struggles. A year can fly by so quickly that stopping to take stock can be difficult, but if we don’t make the time, then how can we expect to learn and grow- or even recognize when we’ve learned and grown? At FMP, we’ve aligned our performance management process to the calendar year, so our workforce is currently going through the process of developing their self-assessments and, in doing so, reflecting on the year. While we have formal performance feedback conversations at the end and middle of the year milestones, we strive to maintain a feedback culture that encourages everyone (project managers, team members, supervisors) to be giving and requesting feedback throughout the year. This feedback can come in many different shapes and sizes- formal, informal, public (if positive), private (if constructive)- and it should always be timely and specific. This gives the recipient the information they need to become aware of, reflect, and take action upon opportunities for growth or reinforce successes. While we feel pretty comfortable with our current performance management process, we recognize that keeping feedback timely, actionable, and accessible is a challenge in our busy, collaborative environment. To help with this, and to also keep current with many of the tools and trends around micro-feedback, we are adopting a new performance feedback tool in 2019. Rhabit is a tool to collect and summarize timely, actionable, and anonymous feedback, about both individuals and the organization. The tool uses frequent micro- surveys that collect information on rated habits- hence the name. Rated+Habits= Rhabit! 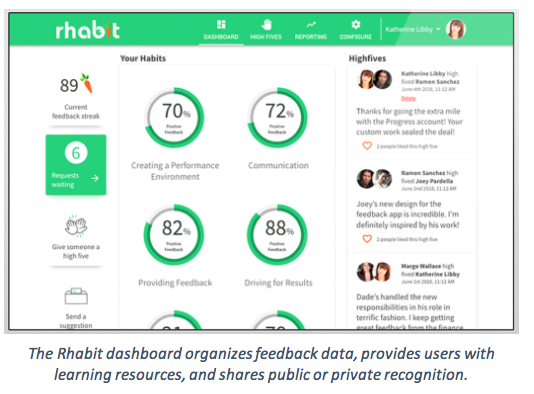 We will begin using Rhabit with our Management team in January, soliciting input and feedback on leadership behaviors, as well as elements of organizational culture and employee engagement. We hope that the tool will reinforce our culture of feedback by 1) providing ongoing, actionable feedback, 2) facilitating individual development and organizational improvement, 3) taking the place of longer, more cumbersome surveys (e.g., Employee Viewpoint Survey, Leadership Survey), and 4) allowing us to try out a leading-edge methodology that might be of interest to many of our clients. After piloting this with our Management team, we intend to roll it out to our entire workforce and evaluate whether it can, in fact, replace some of our existing surveys. We’re so excited about implementing this that we thought we’d share a little background on the how, why, and what Rhabit was developed to do. And, who better to give us that info than the two founders, J. Kevin Kelly and Alexander Schwall? We sat down with them to get a few more details about this cool new tool. First and foremost, who are you guys and what led you to create Rhabit? 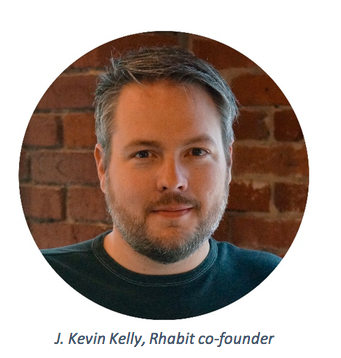 We created Rhabit because we were increasingly frustrated with old school HR instruments and how little value they provide to individuals. A 360-degree feedback or a developmental assessment center are supposed to tell you about your strength and developmental areas, but even in a best-case scenario, a person may get these insights maybe every two years, or often once in their career. People need and want feedback more often. We want people to have this information on a weekly basis. 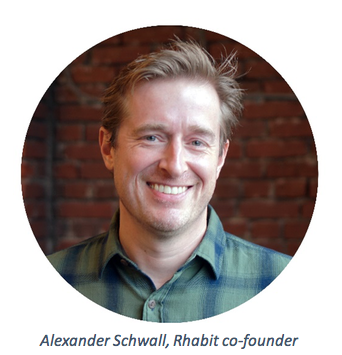 They want to know how they can grow as professionals, so we built Rhabit to give you actionable and continuous feedback – allowing people to not just understand how they’re performing today like an assessment would, but also how they’re changing and growing over time. Tell us a little more about Rhabit– what does it do and how does it work? Rhabit makes it very easy for people to give each other feedback. People give their manager, peers, and direct reports feedback on key behaviors. We call groups of these behaviors “habits”. This means a person is not getting feedback on, say, whether they’re “greeting people with a smile”, but on the practical things that matter such as their ability to meet deadlines, or coming prepared to meetings. We also eliminate the most cumbersome part of the feedback experience – actually coming up with the magic combination of words that is objective, relevant, and helpful. In other words, feedback is given on observable, work relevant behaviors. The feedback is specific, so you know what it is you are doing well, or not so well. People engage with Rhabit’s app to give feedback twice a week, but we’ve designed it to only take a minute or so. Some people do it while waiting for the elevator or while waiting for a conference call to start. You can do it on your phone or any device. For us it was important to make this process very easy and valuable so that people don’t hate it. This is why we’ve been so excited lately for our users to tell us that they like giving feedback and that they look forward to their feedback requests from Rhabit. It’s incredibly validating. What do you hope organizations and individuals will get out of incorporating Rhabit into their ongoing performance and feedback processes? For individuals we want them to be able to own their professional development. I remember being a newly hired consultant. I constantly wondered: “Am I doing this right?” But, nobody would tell me. We think not making it crystal clear for an employee what their strengths and weaknesses are is fundamentally unfair, and in a way, cruel. We want people to clearly understand how they can have more impact and also what is going well for them already. Managers especially often have no awareness that something is not going well. Without feedback they are flying blind. We like to be the source of information that closes the feedback loop. For organizations, we want them to have clear line of sight of who is very effective. Often, companies misunderstand who their best people are. Many great employees are often quiet, heads down, and effective. They may not even talk about their accomplishments and only their close colleagues know what gems they are. In organizations often the louder, confident, but not necessarily effective employees thrive. We’re on a mission to change that. Also, Rhabit makes it quite easy for companies to visualize and understand their talent at scale. Any identified broad skill gaps can then be targeted for development efforts, while sparing strength areas from unnecessary spends on training. By giving companies a platform that clearly visualizes the performance of their people, leaders, and culture at scale, talent leaders now have the ability to drive and influence strategy with data, not just gut feel. What’s next for Rhabit in terms of new features or next steps? Our customers are amazing, and thanks to their continuous feedback (of course we’re all about the feedback) and requests, we have a ton of awesome new features we’re shipping over the next couple of months. On the analytics side, we’re building some incredible tools that make HR analytics a reality for every company, regardless of their technical sophistication. We think they’re going to love our new interactive dashboard that allows company leaders to get a quick, but thorough understanding of their talent. For individuals we’ve created a very engaging experience that moves performance feedback closer to learning and development resources, helping us close the loop between feedback and growth. We’re also working on some incredible tools around coaching, mentorship, and connecting to other content experiences to help support the growth of employees.